Are you thinking about adding signage to your marketing mix? Do you want to design an eye-catching sign that’s effective, but don’t know how to start? Before you begin, you have lots to think about. Here are eight tips to help you understand how to design an effective sign. Signs are usually the first thing that customers notice about your business. Therefore, it pays to take some time to think through what your sign’s purpose should be. What’s the message you want to convey? Do you want to advertise a sale? Do you want to increase brand awareness? Do you want to promote your location? Once you’ve determined the purpose, keep your message simple. Your sign should be eye-catching and readable. Think about the proper hierarchy for your sign. What elements should be the largest? What do you want noticed first? What elements should be secondary? Regardless of whether your sign is displayed indoors or outdoors, a viewer should be able to understand your message quickly. BIGGER is always BETTER! If you place your sign on a street, it should only have a few words. Most people will see it while in a car, so using three to five words is considered ideal. If you place your sign in a window or over an entrance, customers will see it as they walk by. This is a prime opportunity to feature text and images to excite customers about special sales or merchandise. 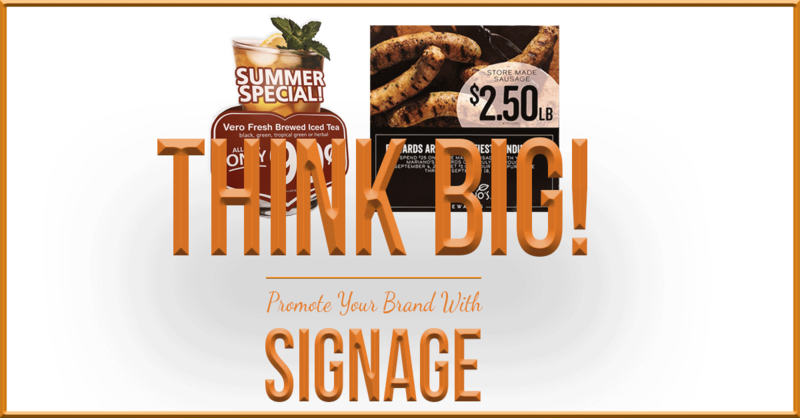 Place indoor signs near the front of the store, counter, or near the promoted product. You can use more words here because the customer will see the sign up-close and under lights. If you place your sign at the point of sale, where a customer is waiting in line, it’s an opportunity to include more information that would be read while waiting. Design your sign based on where it will be placed, consider its size, and make sure the sign is easily distinguishable from its surroundings. Think about the type of material the sign will be printed on early in your process. The placement of your sign will determine cost. Will it be placed indoors or outdoors? How large will it be? How thick will it be? Will it need a stand? Will it be temporary or permanent? Always make these decisions sooner than later, so you can understand the impact to your budget. Set the main headline apart from the rest of the information on your sign by using contrast. Contrast is created with fonts, images, and colors. For example, you could use different colors between text and the background color. You could use big bold text for your headline and a different font for the other text. The important thing to remember about contrast is that the elements should be completely different, not just a little different. Using contrast will help make your message pop and attract attention. Some colored text is hard to read when placed on top of other colors. 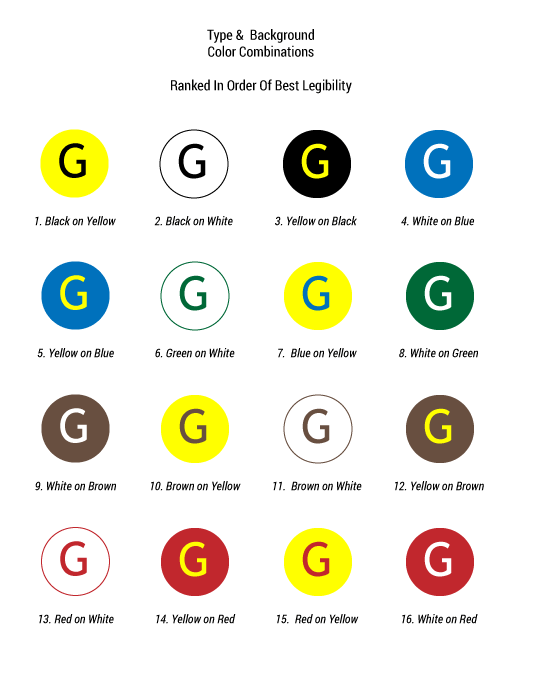 This chart ranks the legibility of color and text. Sans serif fonts are the easiest to read. Avoid using all caps in any of your words. Establish contrast between your primary and secondary messages. If you’re designing a sign for a street, avoid using script or heavy gothic fonts. Don’t attempt to fill in the entire sign. Too much text or imagery is confusing. Surround your letters and images with white (blank) space, it will help give prominence to them. Studies show that 30% to 40% of your sign should be white space. Use signage to promote your brand, build trust, and credibility. Stay focused on your message and try to keep it clean. Before you start any sign design, think about the purpose, size, placement, and materials. These decisions will drive all other aspects of your design. Consider your brand and be consistent whether it’s through your use of color, images, or font. Lastly, the most effective signs include color and imagery. 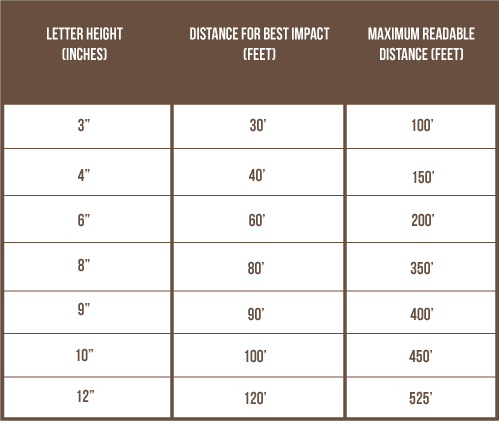 Adding a border to your sign helps focus your customers’ attention so they can read it 26% faster. By presenting special information in a second color, you can increase your customers’ retention by 78%—and draw a better response. * An effective sign design should catch a prospect’s attention in a matter of seconds. We hope these tips will help you with your next signage project.